According to a recent study, long-term effects of cleaning with traditional household cleaners increases the risk of lung damage, including COPD (chronic obstructive pulmonary disease). There are many products now-a-days that claim to be “safer” for you and the environment, but there are still not requirements for these companies to provide proof, let alone tell you what is in their cleaner. Thanks to E-Cloth, you can totally eliminate the use of harmful chemicals because you use only tap water! How does an E-Cloth work? These unique microfiber cloths trap dirt, scrub away at spots and stains, and leave a brilliant shine to all surfaces, including windows, appliances, electronics, kitchen and bathroom surfaces, and so much more. The secret is in their many, many fibers that trap dirt, grease, and bacteria. In fact, there are about 3.1 million fibers per square inch on an average E-Cloth! These fibers hold onto contaminants and do not spread them around. Plus they leave not residues behind. It is hard to believe just how effective this cleaning solution can be until you try them for yourself. To get started, we would recommend the E-Cloth for the surfaces that you find yourself cleaning the most often… or perhaps the surfaces that you have the hardest time cleaning. For many customers, it is windows, but for others it might be stainless steel surfaces or bathroom surfaces that are of most concern. There are over 15 varieties to the E-Cloth and they can be washed up to 300 times and not lose effectiveness – guaranteed! Stop into our Housewares department to see our full selection of cleaning solutions from E-Cloth. 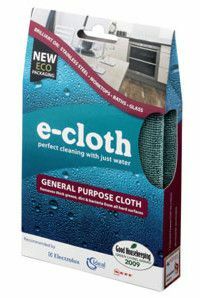 Click here for more information on the E-Cloth revolution and why you should start cleaning with just water.